Top Realtors Share Their Secrets on How to be a Highly Successful Real Estate Professional – and Still have a Life. 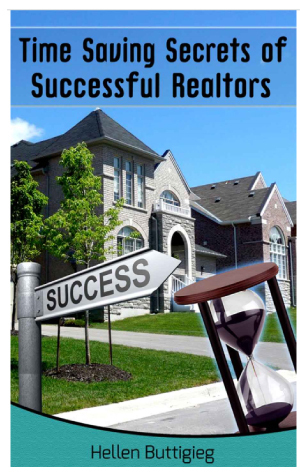 It is with great pleasure we share the launch of Time Saving Secrets of a Successful Realtors book by Hellen Buttigieg that is now available on Amazon. We were honored of being able to contribute to this book. While enjoying a balanced life? Top realtors share their secrets on how to be a highly successful real estate professional – and still have a life. Their time management and life management strategies have been combined with proven methods from veteran Professional Organizer, Life Coach and TV personality Hellen Buttigieg. (Hellen’s company, We Organize U, has been helping busy professionals organize their life for over a decade). The book is FREE for the next 5 days. Please click here to learn more. If you know anyone that would benefit from this eBook, you’re welcomed to forward the link during the free promotional period – so they too can take advantage of this limited time offer. Feel free to email, post to Facebook, Twitter, LinkedIn, etc. Even if you don’t have a Kindle, you can download the free Kindle app and read the book on your computer, tablet or smartphone. Comments Off on Top Realtors Share Their Secrets on How to be a Highly Successful Real Estate Professional – and Still have a Life. Looking for Inspiration for your home decor? Home By Design magazine brings an article this week showing Giana Allen Draws (designer) Inspiration from Multiple Regions for the Rustic Cabins at Pine Creek Sporting Club. Her technique resulted in a relaxed style that welcomes any visitor. For designer Giana Allen, the inspirations for her design work throughout the country stem from her surroundings and experiences: travels to Switzerland and Belgium; summers in New England with family; buying trips to Africa, and hunting weekends in the Florida back country. So when she was tasked with designing the interior of all twenty-three cabins on Pine Creek Sporting Club’s property, she knew exactly where to look for inspiration. For Cabin 7 at Pine Creek—located in Okeechobee, Florida—Allen approached the interior design by tapping into memories from her travels and experiences to create a seamless decor and color palette. “The home is a mix of Palm Beach [and] a more rustic, chic look . . . ” says Allen, who drew inspiration from her time spent living in Palm Beach, Florida for the cool, crisp beachy look of the cabin. The latter style stems from a trip to Europe where she once stayed in a Belgian farm house. It’s a cross between an industrial Belgian farmhouse [and] the slight feel of a western home, she says. The great room serves as a resting and entertaining space. The high, twenty-foot vaulted ceiling provides an element of grandeur, while the horizontal barn wood paneling and stone fireplace are more inviting. “It gives a cozy space a large, grand feeling but keeps it intimate,” says Allen. The earth-tone color palette is worked into the decor via luxurious yet comfortable and practical Belgian linens on the sofas, couches, draperies, and pillows, while a custom Merida sisal rug provides an organic touch to the industrial look and feel of the concrete floors. A large, early 1900s western trunk-turned-coffee table that Allen found on a buying trip to Texas, anchors the conversation area. An oversize chandelier from Allen’s line of home furnishings, Giana Allen Homes, hangs above; always one to incorporate a vintage look, Allen affixed antique corbels to the top of the pendants on the iron chandelier. 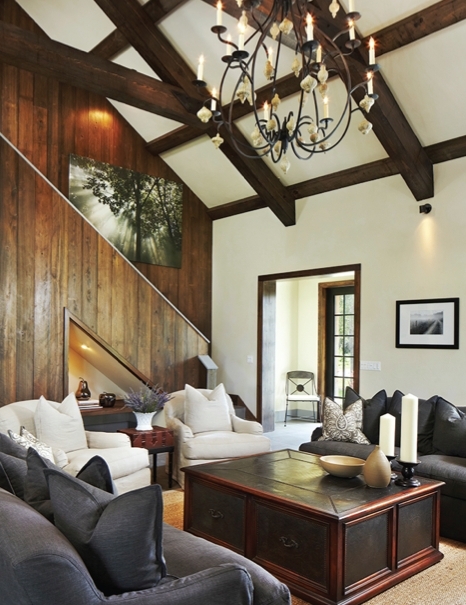 Though the downstairs area is reserved for relaxing, entertaining, and conversation, the upstairs is home to three bedrooms, each boasting a unique take on the Belgian farmhouse theme. With two full beds, the main guest bedroom is inspired by a New England shooting ranch that Allen’s grandfather stayed in when she was a child. “I really went with the farmhouse look in this room,” says Allen, who brought in pops of color through the striped Dash & Albert rug and artwork by Maura Allen. Down the hallway is the bunk room, inspired by a vacation to a chalet in Switzerland, where Allen utilized dead space with two built-in bunks that are spacious enough for adults and kids. The master bedroom, though, is the highlight of the overnight options. A tall, winged headboard swathed in Belgian linen serves as the focal point of the bedroom. Above, lanterns sit atop vintage corbels while wide white barn wood lines the back wall and ceiling giving texture to the space. A custom Merida sisal, and thick, heavy Belgian linen drapery, complete the farmhouse chic decor. “My life really does inspire how I design,” says Allen, who borrowed bits and pieces of her world-wide travels to shape the design of Cabin 7. Her technique resulted in a relaxed style that welcomes any visitor. Barcelona – The Best of the Spanish and French Romance Languages. How colorful and inspirational that city is. Read this article posted by Home By Design this week and learn more about this seductive city. If you are planning to go on vacation you may want to consider Barcelona. The city’s secret weapon is a quirky sense of humor. Storeowners hire graffiti artists to paint their rolling front doors and fashion designers use bright colors and clashing patterns to create clothes that are unexpectedly flattering. Antoni Gaudí’s world-renowned architecture is a bit cheeky; in the Sagrada Família Cathedral, for instance, local tour guides point out that Gaudí included a statue of himself with the twelve apostles. This church, which is easy to easy to spot by the towering spires against the skyline, is the city’s most popular attraction. The architect began construction in 1883 and when he passed away the building was left unfinished. Today it remains in a constant state of construction and the best collective guess is that it will be finished in 2026. A combination of Gothic and Art Nouveau styles, the interior has tall columns with animal carvings on the top, and blue stained glass windows that change color as the sun rises and sets, similar to ocean waves—reflective of Gaudí’s love of nature and creative use of light. Walk along the serpentine trail of aqua colored tiles on the downtown boulevards and you’ll see today’s artists creating watercolors near the futuristic homes Gaudí created more than a hundred years ago. Two of the houses he designed, Casa Batlló, and La Pedrera, are now museums. With these and other homes, Gaudí used recycled materials, such as broken pieces of tile, to create colorful mosaics on the white stucco walls. His rooftop terraces and curving stairwells with rippling glass windows are still being copied today. Finally Park Güell, a large garden also designed by Gaudí, greets visitors with a multicolored mosaic dragon. Have fun discovering the artist’s sculptures and tile work that depict animals hidden among the plants, rocks, and palm trees. Nature lovers will prefer the city’s Parc de la Ciutadella, originally built in 1888 for the International Exposition. Residents must appreciate the classic simplicity because they spend lovely lazy Sundays picnicking with their families on the lawns. The park, which includes a zoo and a lake with boats for hire, also hosts flamenco dance performances. Sundown finds crowds gravitating to the Magic Fountain of Montjuïc. The cascading waterfall changes colors in sync with the music, which ranges from opera to 1980s pop hits. For art you can take home, visit the Gothic Quarter. Only local craftspeople and artisans are allowed to sell in certain sections here and the narrow curving streets are packed with delights such as Catalan ceramics, hot chocolate served with chorizo, and a Custo clothing outlet. The local label is known for its over-the-top designs that reflect the colorful Barcelona environment. The city’s Gothic cathedral is located at the entrance to the Quarter and if you’re lucky you’ll spot locals attending services in their finest church attire. As lovely as the art and architecture are, they can’t compete with Barcelona’s natural beauty such as the white sand beaches that surround the city. The beachfront locations near the former Olympic Village have restaurants with colorful lounging couches where you can rest your tired feet while enjoying bar bites and sipping on sangria or cava. Cuisine is also an art form here. You’ll find tapas that are too pretty to eat, exceptional paella, and a traditional Spanish almond nougat candy called Turrón. For the best seafood visit low-key restaurants in the fisherman’s quarter where they casually hang drying clothes from apartment windows and cook their own catches daily. Isn’t it time you fell in love again? Barcelona is waiting for you. Comments Off on Barcelona – The Best of the Spanish and French Romance Languages.